Former UFC light heavyweight champion Rashad Evans edged out ex-champion Dan Henderson to a split decision victory on the main event of UFC161 in Manitoba, Canada. 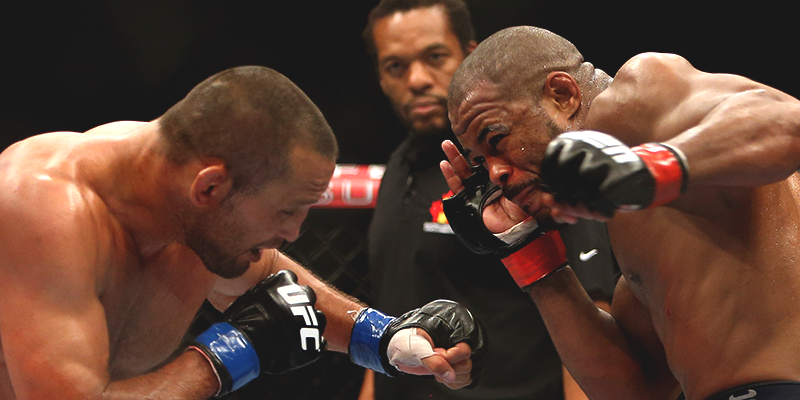 This victory puts Evans in contention for a shot at the UFC light heavyweight champion Jon Jones. The bout started off with both fighters testing the waters and feeling each other out, with little action to speak off. Evans was the busier of the two fighters, but Henderson landed the first telling blow of the fight by walking Evans onto a hard jab, which dropped him. Henderson followed up with a barrage of punches which were mainly off target, too Evans credit, he recovered quickly and returned to his feet before the end of the first round. The second round saw Evans up his pressure on Henderson by throwing more shots and combinations whilst avoiding Hendersons. Evans backed Henderson up against the cage several times during the second round and went for the take down, but Hendersons take down defence was effective at neutralising any of Evans attempts. Though few hurtful bows where landed during the second, Evans was certainly the aggressor. The third and final round saw Henderson begin to fatigue under the increasing pressure from Evans. Evans moved well and landed several scoring punches via effective combinations and at one point appeared to stun Henderson when he had him against the cage, but Henderson survived till the final bell to take it to the judges score cards. The judges saw it 29-28 28-29 and 29-28 in favour of Rashad Evans via split decision, with Rashads superior work rate proving to be the telling factor in a close and competitive bout. Other bouts on the night saw heavyweight Stipe Miocic beat Roy Nelson on a unanimous points decision with it being 30-27 on all score cards. This one sided fight saw Miocic dominate for all three rounds whilst avoiding Nelsons famous overhand right. Nelson never looked likely to win the bout, but survived the full duration to take the fight to the judges’ score cards. This decisive win puts Miocic in the top 10 of the heavy weight division and is defiantly a name to keep an eye on. In another heavyweight bout Shawn Jordan TKO’ed Pat Barry within 59 seconds of the first round. In the welterweight division former opponent of GSP, Jake Shields won via split decision against Tyron Woodley.